I mentioned last week that there are several house projects we'd like to tackle this year. As we work on rearranging furniture and decorating new rooms, I often look to Pinterest, magazines, and home decorating books for inspiration. 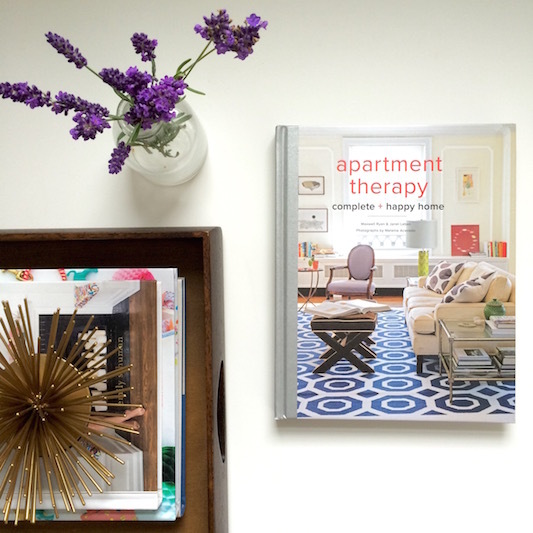 I recently picked up Apartment Therapy's Complete + Happy Home book to see what it had to offer. The first section of this book was full of tips and home decorating "rules" which I found really helpful (the 80/20 rule: neutrals in 80% of the room and highly saturated shades in the other 20%), and it also had a short section focused on setting up each area/room of your home. There was also a small section in the back of the book on tips to maintain your home. A really helpful calendar was included, detailing what you should clean, prep, and decorate in the house each month. The majority of the book showcased photos and descriptions of others' living spaces, which were all beautiful but most were not really my style. Though a fun book to browse through, I didn't really find any inspiration for the way that I want to decorate my own home. I'd say this is definitely worth looking through. There are some great tips included and so many beautiful homes! I'm looking forward to reading The Nesting Place next, which I won during a fun giveaway that my sister held! I've heard really good things about this book and am hopeful I will get some good ideas. The price is very different for apartments these days, not so long ago I finally bought a new apartment and I had to pay for it a fairly large amount of money, it's good that at least on the move I was able to save money using https://www.moveprola.com/marina-del-rey-moving-company/ for that.